Railpictures.ca - Doug Page Photo: At dusk, CN RS18 3712 and C424 3214 lead piggyback train 252 through Bayview at the start of its trip to Montreal. Note the container flats with Dofasco steel several cars back. | Railpictures.ca – Canadian Railway Photography – photographie ferroviaire Canadienne. 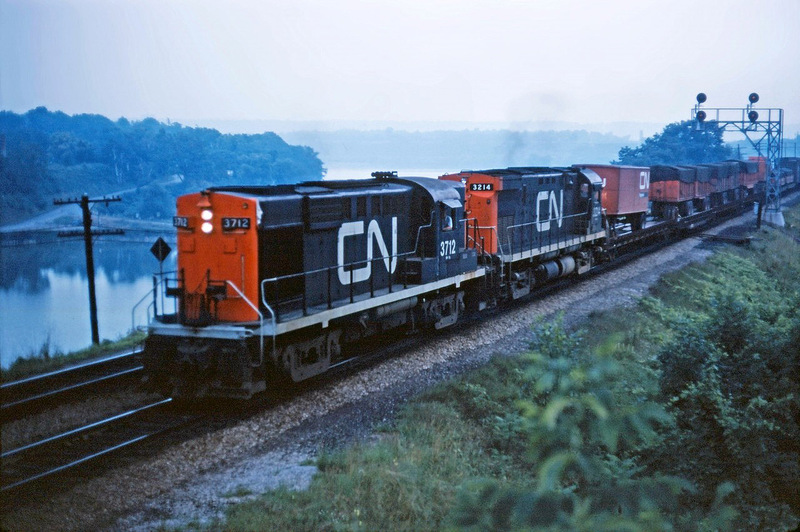 Caption: At dusk, CN RS18 3712 and C424 3214 lead piggyback train 252 through Bayview at the start of its trip to Montreal. Note the container flats with Dofasco steel several cars back.